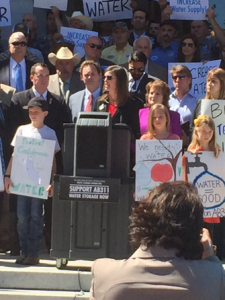 On Monday, the California Cotton Ginners and Growers Association (CCGGA) participated in a press conference at the steps of the State Capitol to help support the passage of AB 311 (Gallagher) which would “expedite” CEQA for water storage projects in California, such as Sites Reservoir and Temperance Flat Dam. Against the backdrop of recently pulled out almond trees, and despite overwhelming support from the agricultural community, the Republican backed bill did not receive a single Democratic vote in the Assembly Natural Resources Committee and died. The bill would have “expedited CEQA” in much the same way as legislation was passed to expedite CEQA for the new basketball arena or the Sacramento Kings professional basketball team. CCGGA President/CEO Roger Isom and CCGGA Director of Technical Services Christopher McGlothlin were on hand for the event. This entry was posted in NEWS & ISSUES on April 29, 2015 by ccgga.